What do Fulton County families and children need most? 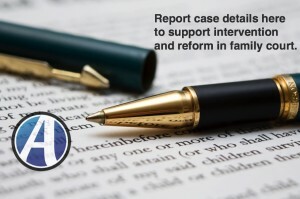 If you ask parents caught in legal conflict, you’ll likely hear the word transparency. 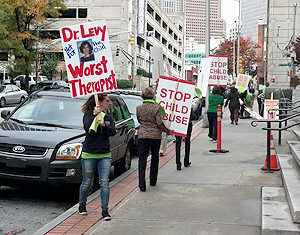 Georgia news media, parents, advocates and legal professionals attended a press conference on April 24th that covered in detail the danger experienced by safe, loving parents and their children in family court cases. The allegations are serious and a plea was made to Fulton County’s District Attorney Paul Howard to investigate the claims. The press conference featured Georgia expert William Perry who is known for his news reports on ethics failures in government. Perry, who goes by Georgia Ethics Watchdog in his reports, learned just how dangerous the legal environment is for families, and decided to do something about it. Several tragic stories were shared and family law attorneys weighed in, agreeing that something needs to be done. Atlanta’s Fox5 News aired the story that evening, doing a remarkable job at laying out what is complicated and challenging to explain. The news report explained that for these parents who are being victimized, nothing is more important to them than their children. Children are reportedly being taken from them without any regard for the law. Perry addressed needed policy changes and spoke about his challenge to law enforcement and other authorities to investigate cases where good parents are wrongfully accused, torn from their children and set up to fail. My Advocate Center’s term to describe the problem is profit over protection. Outcomes make no sense given our laws and the facts in such cases. The real needs of children are thrown by the wayside. Does it need to be this way? The image here was taken by a news team at the Fulton County courthouse in recent years, when custody experts were paid to suppress evidence of child abuse that was substantiated by forensic evaluations and law enforcement. The litigation resulted in protection and proper medical treatment being withheld from the child. Young adults are coming forward now to speak about their experiences such as what this child experienced when outcries for help were ignored and silenced. There is no need to wait in beginning investigations and working to remove danger by closing loopholes in state policies. When families are exploited there is often a lack of transparency and due process in the management of the litigation, so Perry emphasized the need for parties to be allowed to record their own court proceedings. This issue was addressed by Georgia’s Supreme Court and Superior Court judges and includes recommendations from stakeholders in the press, My Advocate Center and other advocacy groups. The new rule changes take effect in May of 2018, benefitting the public, professionals who are ethical and committed to protecting clients and children, and also benefitting the courts in creating more efficiency and positive outcomes. Parents, grandparents, professionals and even children are speaking up about experiences and the need to take action. Contact My Advocate Center’s founder Deb Beacham here to report details to My Advocate Center or to ask for assistance. Learn more about what is happening across Georgia and how investigations can make all the difference in improving safety, family stability, and the ability for parents and children to recover from trauma. Contact My Advocate Center to review case studies and data on these issues. Investigators will discover that the problems described here are wide-spread and found nationwide, but with Fulton County’s large population and high rates of domestic violence and child abuse, there is a special need for a concentrated review of cases in this area. Background material for news reports and investigations can also be found in reports such as this story by an Augusta news station about glaring misconduct by a Guardian ad Litem who manipulated cases based upon whether vulnerable women would comply with his demands, or not. Do Cameras in Courtrooms Make a Difference? There is no question that our citizens are safer when there is transparency in legal matters, but some judges are going out of their way, even issuing gag orders to media in addition to parties and sealing records in select cases, to prevent a review of what goes wrong in child custody matters when laws, facts and evidence are ignored or concealed from the court. For several years I’ve been observing, analyzing and reporting on issues in family conflict matters that are causing avoidable stress and loss to children and to loving, safe and available parents. At the center of all of my research and reporting is the needs of children, which too often are forgotten or just set aside. The reports are not what matters, but the possibility of improving outcomes for children; the correct term for this form of journalism is Solutions-Based Journalism. This form of news media and investigative reporting may not be popular in some circles as it challenges the dangerous status quo, but if it didn’t matter, we wouldn’t be talking about Rule 22 laws and cameras in courtrooms in this state. This is a critical topic the public needs to know is being debated and decided, so I’ll share more of my work and that of other journalists to support understanding and participation in this debate. In the meantime, please ask video journalist Nydia Tisdale about her experience filming public events and proceedings, and ask how you can support her efforts to inform citizens and increase transparency. Her unique work has been featured by news media not only in Georgia but by the Associated Press for her bold moves to support open government and greater public participation. The more you know, the greater likelihood you’ll contact your legislators and your local news media because we do need cameras in courtrooms and we do need ongoing reporting about how family conflict and legal matters are managed. A major issue for all, including for ethical, talented legal and healthcare professionals, is that foul play by certain other professionals is rampant and worsening with each year. In part this is due to a vulnerable and unsuspecting public but is also due to a cloudy courtroom landscape where it is easy to disguise bad faith and unethical tactics used to increase billable hours. Another factor in the worsening of predatory & harmful case management is that certain judges are willing to play along, such as in this highly unusual Augusta situation which was investigated and reported on by local news media. In the case featured in the news report below, the judge gave custody of the mother’s daughter to her ex-boyfriend when he gave custody of her two sons to this man, their father. However, the man has no biological or legal relationship to the girl, meaning this child and her mother were tormented and torn apart unnecessarily. Note: I have no connection to these parties, no bias or preference other than for facts and laws to count for the children involved. After studying dozens of cases closely in the Augusta Judicial Circuit, collaborating with local news media & seeing news stories through to completion, I know these courtrooms and local practices well and stand by my work and these news reports. Also worth noting, this is not water under the bridge for these children and their families; the damages are ongoing, and more families are being harmed in similar ways as you read this. If the facts and evidence of this case justified an award of custody to the father of the boys, that would be reasonable, but the court also ignored the physical, visible evidence of family violence. In a separate conversation we’ll feature more of the instruction for judges pursuant to the Georgia Domestic Violence Bench Book, which should be required reading for court officers and court staff such as clerks, social workers and others working with judges on these cases. This Bench Book is available online and published as a 10th edition, with participation from dozens of professionals from around the state of Georgia, so it’s not a secret to our courts that family violence, including in making determinations of custody and visitation, is a matter to be taken seriously. Please review this news report and ask yourself how this could happen, why a judge would do this, and if the judge is making this kind of ruling, what else is going wrong in his courtroom. Another key question is whether or not this court and this family could have benefitted from the application of instructions found in the Judicial Guide to Child Custody. First, learn about your local courts before you enter into a legal action. Learn about practices of professionals before you sign agreements and pay retainers. Understand why so many families are losing their homes, health and jobs during or following litigation and especially why so many children are kept in or moved to unsafe environments. Next, learn about accountability systems that exist to provide oversight of professional conduct, including judges and other court officers and experts who help determine outcomes. Do you see any consequences being given to professionals in your area or are you familiar with any investigations into questionable conduct of those managing these types of cases? Learn from the testimony of lawyers, doctors, teachers, parents, grandparents and others who are brave enough and articulate enough to state clearly what they experience or witness, and who are willing to call it what it is – especially if something improper has transpired, as in this Augusta news report. Remember that all of these court professionals, including judges and child custody experts, are human, meaning they make mistakes, become fatigued and even worn out by the extreme emotions displayed in these cases; none of them, and none of us, are perfect. But the reality is that they have sworn to uphold our laws and they have a duty to do what is right by the children caught in litigation and who are often torn apart in the process. Where you have the opportunity to encourage the use of cameras in courtrooms, with proper approval of Rule 22 Requests to Record, Videotape and/or Audiotape, to Televise or otherwise make publicly available these proceedings, please do so as it is highly likely you will help save lives. Please contact My Advocate Center and let me know if you have questions or would like to contribute toward making these solutions available. 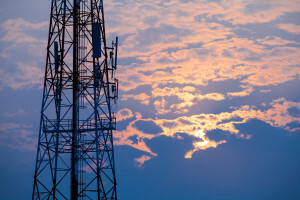 Protected: Federal Racketeering Charges Against Advocates and Radio Show Host?